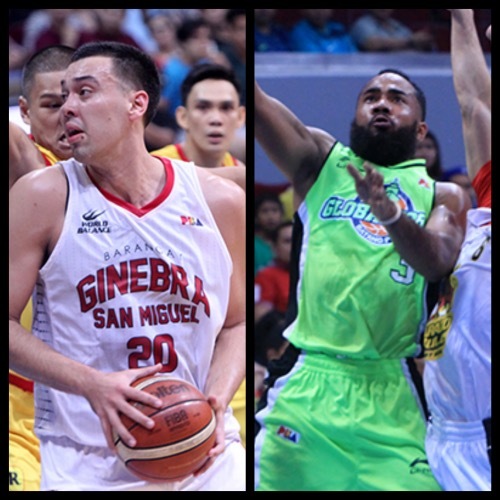 Hoop Nut 2015-2016 PBA Philippine Cup Ginebra Global Port PBA PBA Preview #PBA2016 PHILIPPINE CUP QUARTERFINALS PREVIEW: GLOBALPORT BATANG PIER vs BARANGAY GINEBRA GIN KINGS - PHASE TWO FACE OFF! #PBA2016 PHILIPPINE CUP QUARTERFINALS PREVIEW: GLOBALPORT BATANG PIER vs BARANGAY GINEBRA GIN KINGS - PHASE TWO FACE OFF! GlobalPort and Ginebra had contrasting wins in the first phase of the quarterfinals on Christmas Day, but the results were identical — gaining tickets to this one-game knockout affair for the right to face the top-seeded Alaska Aces in the best-of-7 semifinals. The Batang Pier used a huge third period blast to open things up against Barako Bull and play keep away in the final frame to prevail, 94-85. Terrence Romeo exploded in that game, dropping 33 points, while Stanley Pringle recorded his second double-double against Barako Bull this season. Those two guys will certainly play big roles again for GLO here as they try to upstage and upend the bigger crowd favorite Gin Kings. Six down, six left standing in the #PBA2016 Philippine Cup! Speaking of the Gin Kings, they exhibited #NeverSayDie to the nth degree in their stirring overtime win over Star, 92-89. The backcourt combo of LA Tenorio, Scottie Thompson, and Sol Mercado made the biggest plays for GIN in that pivotal win, and that should give them a lot of momentum and confidence heading into this encounter with the ultra explosive Batang Pier. - Terrenceo Romeo came up huge in the second half for GLO, scoring all but six of his 33 markers to lead the Batang Pier’s rally. Throughout 2015, Romeo has shown that he can light it up at the drop of a hat, whether he played for GLO, Gilas, or the Philippine 3x3 team. Now that GLO is on the verge of making its franchise-first semifinals, expect Romeo to leave everything out on the floor once again. Last game: 33pts, 9rebs, 5asts, 1stl, 6 triples. - Stanley Pringle didn’t have his best shooting game against BAR, but he more than made up for it with his super-sized presence on defense and on the glass. Pringle padded his stat-line with 13 rebounds, 4 assists, and 1 steal to help GLO get rid of the Energy. He will have to work extra hard again here against the Gin Kings, who possess a very versatile backcourt that can hurt teams in many ways. Pringle didn’t shoot well vs GIN in their last game, so he will look to bounce back in this one. - One reason GLO was able to beat BAR was great defense, or better yet, turning great defense into even better offense. GLO forced BAR to commit 23 turnovers and turned these into 19 points off turnovers, which underscored the Batang Pier’s ability to play well on both ends. Against the Gin Kings, who have the 3rd highest turnover rate in the league, the Batang Pier have a golden opportunity to pounce once again. - Sol Mercado struggled early in their match-up against the Hotshots, but he came alive in the second half with timely bursts of offense and defense. He hit some big threes late in regulation before getting a huge steal that could have given GIN the win. He missed the easy fastbreak lay-up, but he compensated for that in OT by handing out the winning assist to Tenorio, who hit the game-winning three-pointer. Despite his struggles, Mercado soldiered on, and he will have to do that again here against the dynamic duo of Pringle and Romeo. - Greg Slaughter was somewhat limited against the scrappy STA forntline, but he needs to really show up and dominate against an undersized GLO frontcourt. Slaughter is statistically the best player right now in the conference, and the Kings will be hard-pressed to move on to the next round unless they can get their pried slotman going. He had a very good outing against GLO in their win earlier this conference, so he is expected to be effective here again. - In their win over STA, GIN’s shooters showed up when they needed to, especially in the fourth period and OT. In their last game against GLO, GIN shot just 1/9 form beyond the arc, and that’s something they cannot afford to do again. GIN should expect a lot of adjustments from GLO to make life tough for guys like Greg and Japeth down low, so outside shooting will be crucial in helping the Gin Kings’ bigs to have more breathing room around the basket. - In many ways, Terrence Romeo plays a lot like Mark Caguioa. Romeo is fearless, streaky, and loves the big moments. Caguioa has built a career on those same attributes, too. On a very big stage, it’ll be interesting to see how the young, up-and-coming Romeo faces off against the veteran Caguioa. Romeo’s star is rising, of course, while Caguioa’s is in the sunset of his storied pro career, but don’t count the veteran out just yet especially since he caught fire the last time these teams played each other. Last game Romeo: 33pts, 9rebs, 5asts, 1stl, 6 triples. Caguioa Last game vs GLO: 22pts, 4rebs, 2asts, 5stls, 10/20 FGs. - Mark Caguioa put up his best performance yet this season while Greg Slaughter continued his impressive form as they led the streaking Barangay Ginebra San Miguel to an 85-70 victory over the GlobalPort Batang Pier in the SMART BRO PBA Philippine Cup Wednesday at SMART-Araneta Coliseum. Caguioa scored 22 points and also had five steals as “The Spark” finally registered an explosive game after a quiet start this conference. Slaughter was in his usual business, compiling 22 points and 21 rebounds for another monster outing as Ginebra (4-3) notched its third straight win — a feat the Gin Kings had not done for more than a year. LA Tenorio also had 18 points as he stood his ground against GlobalPort’s young but explosive guards in Stanley Pringle and Terrence Romeo. Jay Washington made 18 markers for GlobalPort (3-3), which got 13 from Pringle and only 10 from Romeo, who only made two of his 10 shots from the field as they suffered their second straight loss. Pringle + Romeo: 7/26 FG shooting. So, who do you have winning and moving on to face the Alaska Aces in the next round? Who are the @Alaska_Aces going to face in the semifinals with the Ginebra-Globalport game later?